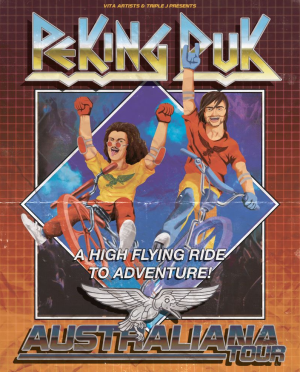 Peking Duk have rolled out a tour poster that’s making us want to reach for our nearest Betamax copy of ‘BMX Bandits’ (we don’t actually own a Betamax copy of ‘BMX Bandits’) to promote their upcoming ‘Australiana’ tour. Dubbed “A High Flying Ride To Adventure”, the tour will make stops in all state capitals (with the exception of Hobart), including a performance as part of the Clipsal 500 V8 Supercars race in Adelaide on March 04. Tickets are on sale from 9am AEDT this Friday.